Four species of Heliodinidae are known to occur in Illinois. Although some of them are somewhat similar in external appearance of the adult moths, they are all distinctly different on male and female genital morphology, and on larval appearance and biology. All of them feed as larvae on wild four o'clock, Mirabilis nyctaginea (Nyctaginaceae). 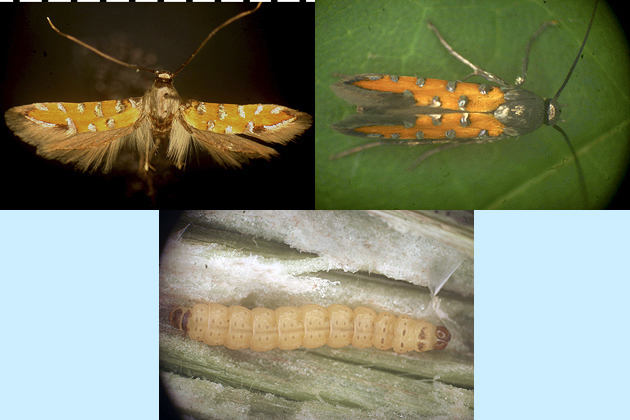 Although larvae of all four species can occur on the same M. nyctaginea plant at the same time, their respective uses of the plant differ; apparently, they have partitioned the hostplant resource. All four species have several overlapping generations per year. In these four species, the larva does not spin a cocoon before pupating (sometimes a minimal sheet of silk is spun). The distinctive, laterally-keeled pupa (Fig. 1) usually occurs in the crevice of a leaf. Adults are bright orange with black and metallic lead-gray scaling, the latter often occurring in small raised patches on the forewing. The adult of one of the four species elevates the hind legs when at rest; those of the other three species do not (this elevated leg position is also seen, via independent derivation, in a few non-heliodinid microlepidoptera groups, e.g., Cycloplasis, Schreckensteinia, and Stathmopoda). Adults of the four Illinois species of heliodinids are active during the daytime hours, when they can be found sitting preferentially on M. nyctaginea. They also visit flowers of yarrow, Achillea millefolium (Asteraceae), where it occurs near wild four o'clock. All of these species were placed in Heliodines prior to the revision by Hsu and Powell (2005). The genus names given below are reflective of that work. To coincide with the Hodges et al. (1983) checklist, two additional genera, Cycloplasis and Schreckensteinia, are also included here. The family affiliation of Cycloplasis is unresolved. Schreckensteinia is generally assigned to its own family, Schreckensteiniidae; it is known not to be yponomeutoid, but its superfamily affiliation has not been definitively ascribed. Figure 1. Aetole tripunctella. Pupa, dorsal aspect, showing the distinctive laterally-keeled form that is typical of Heliodinidae. Aetole tripunctella (Fig. 2) is a leaf miner. The larva can readily leave an existing mine and begin a new one, which most individuals of this species appear to do throughout larval life (a possible example of the "MX missile" strategy). 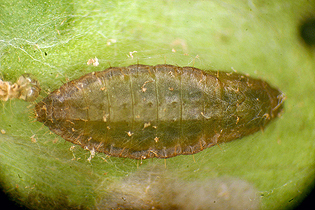 The larva of A. tripunctella first appears in early May, which is somewhat earlier than the larvae of the other two leaf-feeding species; and it occurs in lower densities than do those two species. It is medium yellowish green with a nearly concolorous head and prothoracic shield, and a number of small darkened pinacula can be seen at the bases of some of the setae, especially on the dorsal areas of the thorax. The adult is easily distinguished from the other three species by the forewing coloration and the orange abdomen. Also, this is the only one of the four species in which the adult holds the hind legs elevated. Figure 2. Aetole tripunctella. 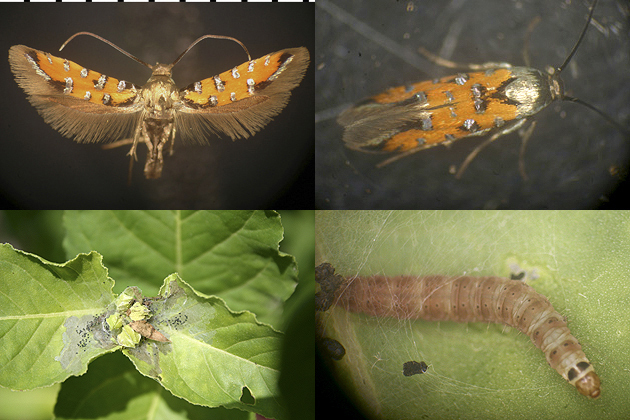 Top: left, spread adult; center and right, live adult; bottom: left, leaf mines on wild four o'clock, Mirabilis nyctaginea (Nyctaginaceae); right, mature larva. Neoheliodines cliffordi (Fig. 3) was not recognized and described as a distinct species until the 1990s (Harrison and Passoa 1995). The larva is pale green with a blackish head and prothoracic shield. It is a leaf skeletonizer, usually on the undersides of leaves near the bottom of the plant. The adult can be differentiated from the following two species in that, on the forewing, it has only five (rather than six) metallic scale patches on the costa, and one metallic patch interrupts the distal margin of the orange area. Also, there is more black scaling between the second and third costal patches than in the other two species, and the area between the anterior and posterior black areas in the basal third of the wing is yellow, in contrast with the orange ground color. Figure 3. Neoheliodines cliffordi. 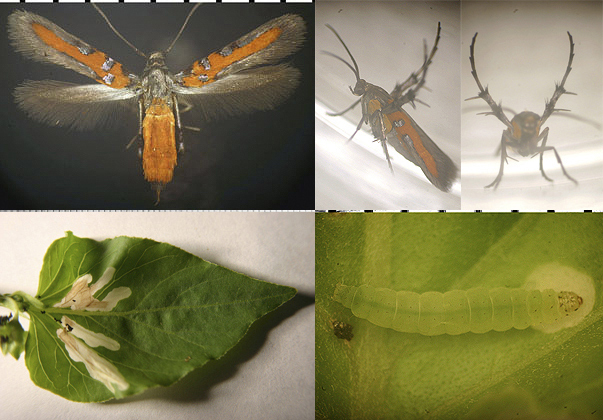 Top: left, spread adult, reared from leaf-skeletonizing larva on wild four o'clock, Mirabilis nyctaginea (Nyctaginaceae); right, live adult; bottom: left, underside of leaf of Mirabilis nyctaginea from low on the plant, showing leaf skeletonization, frass, and webbing produced by multiple larvae; right, mature larva. Neoheliodines nyctaginella (Fig. 4), like N. cliffordi, is a leaf skeletonizer. However, the larva of N. nyctaginella is reddish brown in color, with a tan head, and it shows a tendency to skeletonize the uppersides of leaves in the top part of the plant (often silking together the flower and the leaf immediately below it). The adult is most similar to Embola ionis (below) but can be easily differentiated from that species by the presence of a black lining on the hind margin of the forewing between the wing base and the first metallic scale patch; this black lining is absent in E. ionis. Figure 4. Neoheliodines nyctaginella. 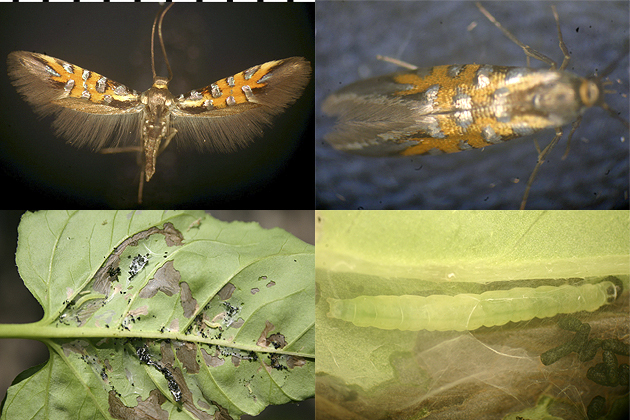 Top: left, spread adult, reared from leaf-skeletonizing larva on wild four o'clock, Mirabilis nyctaginea (Nyctaginaceae); right, live adult; bottom: left, apex of M. nyctaginea plant showing typical larval damage of N. nyctaginella, with webbing, frass, and skeletonization on uppersides of the flower-tending leaves; right, mature larva. Embola ionis (Fig. 5) is a stem borer; the larva is unpigmented and yellowish in color, as is typical for that mode of life. It has sclerotized plates dorsally on the first thoracic and ninth and tenth abdominal segments, and some of the primary setae have lightly-sclerotized pinacula at their bases. A weevil larva also inhabits stems of M. nyctaginea; it can be easily differentiated from E. ionis by the fact that it has no legs or prolegs (which are present and fully developed in E. ionis, as in other heliodinid larvae). The larva of E. ionis pupates inside the stem, after cutting a small hole nearly through to the exterior, to serve as an "emergence window." The window is small and inconspicuous, and the stem bears no other external evidence that it contains a larva, other than that it sometimes can be felt to be less solid than an uninfested stem. The mature larva of the final generation of the season (September in central Illinois) undergoes an extra molt, into a sixth instar, and it is in this stage that it overwinters, inside the stem. The adult is most similar to N. nyctaginella (above) but is easily differentiated from that species by the absence of black edging on the posterior margin of the forewing between the wing base and the first metallic scale patch. Figure 5. Embola ionis. Top: left, spread adult, reared from stem-boring larva on wild four o'clock, Mirabilis nyctaginea (Nyctaginaceae); right, live adult; bottom: larva in opened stem of M. nyctaginea; this larva was collected on 2 September; the late date in the season might have suggested that it would be in overwintering mode; however, it continued development, pupated, and emerged as an adult on 27 September. Cycloplasis panicifoliella (Fig. 6) is a leaf miner on deer-tongue grass, Dicanthelium (formerly Panicum) clandestinum (Poaceae), a plant of low-lying deciduous forest. Leaf mines appear in June and again late in summer, indicating more than one generation. The mine is a flat upperside blotch of irregular shape. When the larva finishes feeding, it prepares for pupation by cutting a circular piece from the upper wall of the mine and then folding the piece in half and silking the edges together from the inside, to create a semicircular pupal chamber that then drops from the host leaf. 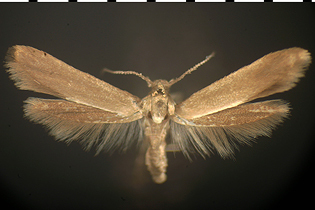 The adult is a tiny moth that sits with the hind legs elevated (as in Aetole tripunctella, shown above); the tibiae and tarsi of the hind legs are adorned with many elongate spines. The placement of this genus within Lepidoptera is unresolved, but based on morphology of the larva, pupa, and adult, it can be said with certainty that it does not belong in Heliodinidae. Figure 6. Cycloplasis panicifoliella. 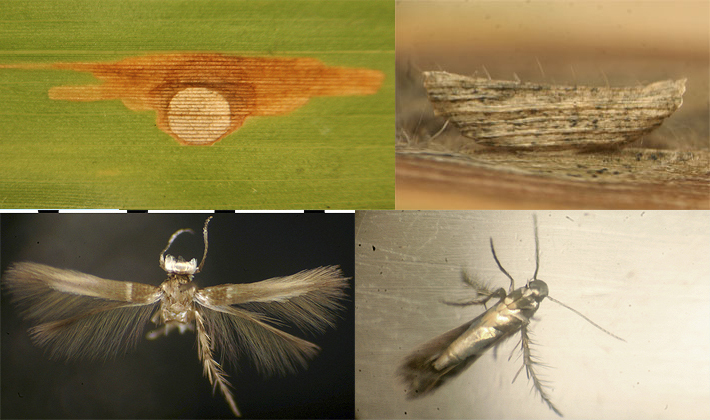 Top: left, evacuated leaf mine on deer-tongue grass, Dicanthelium clandestinum (Poaceae), showing the distinctive circular area from which a piece was cut by the larva from the upper wall of the mine, to form a pupal chamber; right, pupal chamber, sitting on circular excavated area of leaf; bottom: left, spread adult; right, live adult. Schreckensteinia erythriella (Fig. 7) feeds as a larva on flowers or fruits of sumac, Rhus sp. (Anacardiaceae). The hind legs of the resting adult are held elevated, as in the fashion of Aetole tripunctella, shown above. Schreckensteinia, however, is neither heliodinid nor yponomeutoid. A somewhat similar species, S. festaliella, the larva of which is a leaf skeletonizer on raspberry, Rubus sp. (Rosaceae), is also known from Illinois. Figure 7. Schreckensteinia erythriella. Adult, collected at light.